(3) 2011 Ford F750 --- Single Axle, ISB Cummins 250 HP, Allison Automatic 6 Speed, 5.13 Ratio, 12,000 Front Axle, 21,000 Rear Axle, 194" Wheelbase, 14' Bridge, Spring, Pintle Hitch with Air Brakes, 12' Steel Dump Body, 24" Sides, Steel Wheels, Aluminum Fuel Tank, Cruise Control, Tilt Steering Wheel, P/S, AC. 2009 Ford F750 XL --- Single Axle, ISB Cummins 240 HP, Manual 7 Speed, 12,000 Front Axle, 21,000 Rear Axle, 182" Wheelbase, Spring, Pintle Hitch with Air Brakes, 14' Steel Body, Steel Wheels, Aluminum Fuel Tank, High Level Interior, Cruise Control, Tilt Steering Wheel, AM/FM, P/S, AC. 2008 Sterling LT9513 --- Tandem Axle, MBE 4000 Mercedes 450 HP, Eaton-Fuller Manual 8LL, 4.56 Ratio, 18,000 Front Axle, 46,000 Rear Axle, 204" Wheelbase, 19' 3" Bridge, Hendrickson, Double Frame, 3 Stage Engine Brake, Full Locking Rears, 22.5' Steel Jerr-Dan Roll Back Body, Aluminum Front Wheels, Steel Rear Wheels, Engine Heater Plug, Single Stack, Aluminum Fuel Tank, Daylite Doors, Air Ride Cab, High Level Interior, Cruise Control, Tilt & Telescopic Steering Wheel, AM/FM CD, Power Windows, P/L, P/S, AC. 2007 Kenworth T800 --- Tandem Axle, C13 Caterpillar 335 HP, Manual 10 Speed, 3.55 Ratio, 16,000 Front Axle, 40,000 Rear Axle, 265" Wheelbase, 24' 5" Bridge, HaulMaax, 3 Stage Engine Brake, Axle & Differential, Aluminum Front Wheels, Steel Rear Wheels, Dual Stacks, Aluminum Fuel Tanks, Peep Window, Dual High Back Seats, High Level Interior, Heated Mirrors, Cruise Control, Tilt & Telescopic Steering Wheel, AM/FM CD, Power Windows, P/L, P/S, AC. 2007 Ford F650 --- Single Axle, 5.9 Cummins 260 HP, Allison Automatic 5 Speed, 8,500 Front Axle, 17,500 Rear Axle, 227" Wheelbase, Spring, 15 1/2' Steel Body, Steel Wheels, High Level Interior, Cruise Control, Tilt Steering Wheel, AM/FM, AC. 2006 Freightliner Business Class M2 106 --- Tandem Axle, C7 Caterpillar 300 HP, Allison Automatic 5 Speed, 5.29 Ratio, 18,000 Front Axle, 40,000 Rear Axle, 266" Wheelbase, 24' 6" Bridge, TufTrac, Air Brake, Differential Lock, 24' American Body, Steel Wheels, Aluminum Fuel Tank, Dual High Back Seats, Cruise Control, AM/FM CD, P/S, AC. 2006 Peterbilt 378 --- Tri Axle, C15 Caterpillar 475 HP, Eaton-Fuller Manual 18 Speed, 13,200 Front Axle, 46,000 Rear Axle, 270" Wheelbase, 24' 8" Bridge, Air Ride, Double Frame, 3 Stage Engine Brake, Air Brake, Full Locking Rears, 26' Aluminum EBY Body, 1 Steerable Lift Axle, Aluminum Front Wheels, Steel Rear Wheels, Engine Heater Plug, Dual Stacks, Dual Stainless Steel Breathers, Aluminum Fuel Tanks, Peep Window, Air Ride Cab, High Level Interior, Wood Grain Dash, Chrome Gauge Package, Heated Mirrors, Cruise Control, Tilt Steering Wheel, AM/FM CD, Passenger Power Window, P/S, AC. 2005 GMC C7500 --- Single Axle, 7.8L Duramax 215 HP, Manual 6 Speed, 4.33 Ratio, 10,000 Front Axle, 19,000 Rear Axle, 206" Wheelbase, 17' 2" Bridge, Spring, Air Brake, Steel Wheels, Engine Heater Plug, Aluminum Fuel Tanks, Dual High Back Seats, High Level Interior, Heated Mirrors, Cruise Control, Tilt Steering Wheel, AM/FM, P/S, AC. 2004 Freightliner M2 --- Single Axle, C7 Caterpillar 210 HP, Allison Automatic 6 Speed, 6.43 Ratio, 12,000 Front Axle, 21,000 Rear Axle, 192" Wheelbase, 16' Bridge, Spring, Reese Hitch, Steel Wheels, Engine Heater Plug, Aluminum Fuel Tank, Daylite Doors, High Level Interior, Cruise Control, AM/FM, P/S, AC. 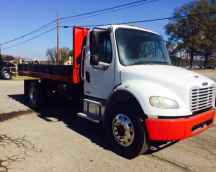 2004 Freightliner M2106 --- Single Axle, OM906 Mercedes 300 HP, Smart Shift Automatic 6 Speed, 4.88 Ratio, 12,000 Front Axle, 20,000 Rear Axle, 186" Wheelbase, 16' Bridge, Spring, Air Brake, Steel Body, Steel Wheels, Wood Grain Dash, Cruise Control, AM/FM CD, P/S, AC.